Doug Henry, long serving player, captain, coach, selector, manager, administrator and volunteer worker has been duly recognised by having the entrance road to the Mullumbimby Leagues Club sporting facilities named in his honour. Doug began a long playing career with Mullumbimby Rugby League Football Club as a teenager, playing in his first A Grade premiership team in 1948. He went on to win a number of premierships with the club in a long and stellar career and was invited to play representative football with Richmond. In the later years of his career Doug was appointed captain-coach of the A grade team. After finishing playing in the late 50’s Doug assisted as a selector and manager of teams before becoming involved as an administrator. He held every executive position in the club and as President took it from a struggling small town team to the community based club which now calls these wonderful facilities home. Doug was very much involved as a volunteer worker with the club, helping to develop facilities at the Recreation Ground, Showground and Botanical Gardens which at times were the home of the Mullumbimby Rugby League Football Club. Other sports are now the beneficiary of Doug’s determination and vision. Doug was awarded life membership of the club and it is especially fitting that Doug’s name will be evident for all to see as they visit the present Leagues Club facilities as Doug’s carpentry skills and building knowledge were in demand as he supervised the original building of the Licensed Leagues Club and the recent extensions. It was with much pride that the club recently held a naming ceremony for the Doug Henry Drive to show its appreciation for the lifetime of service and commitment Doug has given to this club. 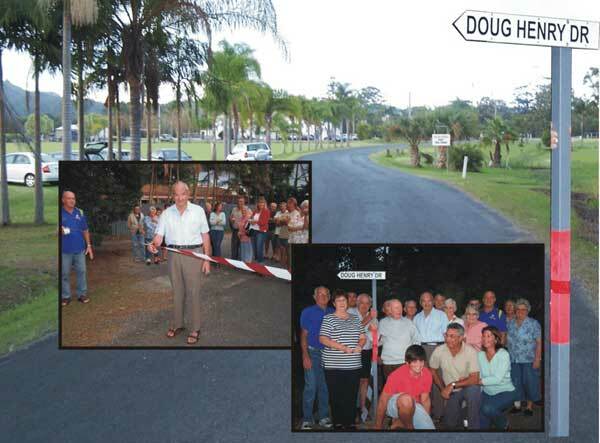 When Doug cut the ribbon it bestowed a name on a roadway that will always remember a much respected and loyal member of the Mullumbimby Rugby League Football Club. A fitting tribute to Doug.